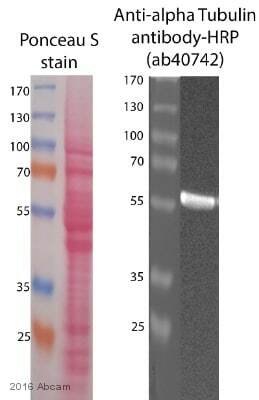 Full length native protein (purified) corresponding to Chicken alpha Tubulin. This antibody gave a positive signal in the following: HeLa (Human epithelial carcinoma cell line) Whole Cell Lysate NIH 3T3 (Mouse embryonic fibroblast cell line) Whole Cell Lysate Brain (Rat) Tissue Lysate - normal tissue Xenopus (Blastula) Whole Cell Lysate. IHC-P: FFPE human colon (normal) tissue sections. Our Abpromise guarantee covers the use of ab40742 in the following tested applications. WB 1/5000. 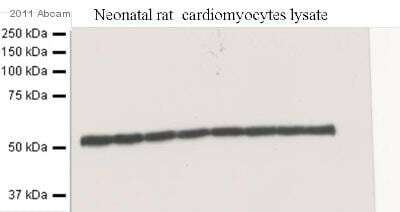 Detects a band of approximately 57 kDa (predicted molecular weight: 50 kDa). IHC-P 1/100. Perform heat mediated antigen retrieval with citrate buffer pH 6 before commencing with IHC staining protocol. Tubulin is the major constituent of microtubules. It binds two moles of GTP, one at an exchangeable site on the beta chain and one at a non-exchangeable site on the alpha chain. Belongs to the tubulin family. Some glutamate residues at the C-terminus are polyglutamylated. This modification occurs exclusively on glutamate residues and results in polyglutamate chains on the gamma-carboxyl group. Also monoglycylated but not polyglycylated due to the absence of functional TTLL10 in human. Monoglycylation is mainly limited to tubulin incorporated into axonemes (cilia and flagella) whereas glutamylation is prevalent in neuronal cells, centrioles, axonemes, and the mitotic spindle. Both modifications can coexist on the same protein on adjacent residues, and lowering glycylation levels increases polyglutamylation, and reciprocally. The precise function of such modifications is still unclear but they regulate the assembly and dynamics of axonemal microtubules. Acetylation of alpha chains at Lys-40 stabilizes microtubules and affects affinity and processivity of microtubule motors. This modification has a role in multiple cellular functions, ranging from cell motility, cell cycle progression or cell differentiation to intracellular trafficking and signaling. IHC image of alpha Tubulin staining in a section of formalin-fixed paraffin-embedded normal human colon tissue*, performed on a Leica BONDTM. The section was pre-treated using heat mediated antigen retrieval with sodium citrate buffer (pH6, epitope retrieval solution 1) for 20mins. The section was then incubated with ab40742, 1/100 dilution, for 15 mins at room temperature. DAB was used as the chromogen. The section was then counterstained with haematoxylin and mounted with DPX. The inset negative control image is taken from an identical assay without primary antibody. Publishing research using ab40742? Please let us know so that we can cite the reference in this datasheet.